I find myself in a bit of a tizzy about how to phrase this blog about the potential threat to food security as a result of climate change induced droughts. Shall I play the “everything is beautiful and perfect game” that is the norm for smoke-and-mirrors corporate business interests? Or shall I move with integrity and transparency while voicing my environmental science expertise? Well, is appears to be obvious that the best strategy is to move forward with the facts and plead with the public to assume their responsibility as environmental stewards to help “save the world” from ourselves. A well informed community has the ability to mobilize their resources to make a difference with conserving water usage. For example; transforming a high maintenance, water guzzling lawn to a xeriscape yard filled with native species of plants spiced with some food crops. The over 400,000 people marched in New York City as a sign of the growing numbers that recognize Climate Change is real, undeniably. One of the major impacts from this 20th century environmental phenomenon is drought conditions that are plaguing the southwestern United States. The Ogallala Aquifer is not being replenished as large amounts of water is being sucked out of the ground. Many man-made reservoirs in California and Nevada are shrinking while water serves to provide for the needs of people. A large amount of water is used to irrigate large tracks of agricultural land in attempts to feed the exponentially growing population. California leads and Texas comes in second as the major suppliers of agricultural crops in the country (1). The monumental “Red Flag” is our food security is at risk. Yes, it is best that everyone says it out loud, “Climate Change is Real”. Greenhouse gases, particulate matter, and dust are wafting into the skies. These gases and particulates act as a nucleus for water molecules to attach and be held in the atmosphere. In urban environments, fresh water is been mixed with pollution and sewage, burdening the municipalities to purify the liquid. Drainage systems and non-permeable surfaces channel rain water towards the oceans. Perhaps some strategic water management innovative designs are in order? Redesigning our infrastructure using bio-inspired techniques offer a first step to effectively manage water. Natural systems have managed and stored water for centuries. The Ogallala Aquifer is a perfect example of an underground water storage ecosystem. The High Plains aquifer encompasses 174,000 square miles beneath eight states, from South Dakota to Texas (2). Sixty percent in the waters decline has occurred to satisfy the irrigation and personal needs of Texans and food consumers. A Kansas study estimated that this magnificent aquifer may run dry within 50 years. The Texas Center for Geospatial Technology estimates some Texas counties may only have 15 years left of usable water supplies from this ecosystem. A major problem is the amount of water that is withdrawn is not being monitored so it is difficult to measure the impacts from water usage. California and Nevada used a traditional storage strategy to manage water by constructing a dam and creating a reservoir. This strategy may not be a viable management strategy due to the large amount of water surface area that is exposed to evaporation. 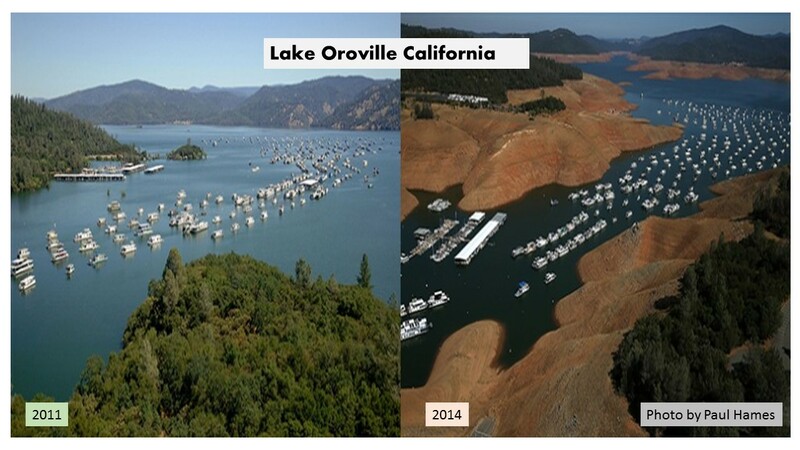 You may be impacted by the pictures of California’s (CA) chronic drought conditions that have impacted Lake Oroville, reduced to 32% capacity, and the CA Sacramento County, Folsom Lake reservoir, only filled to 40% capacity (5). A major challenge faces water managers in relation to Nevada’s Lake Mead. It is hoped to satisfy water needs through 2015 before sounding the alarm of a key shortage declaration (3). Lake Mead’s water is used to satisfy the needs of 40 million people and the cities of Las Vegas, Phoenix, and Los Angeles. The reservoir is about 39% filled to capacity and is located at 1,082 feet above sea level. Water is needed to irrigate our agricultural crops. Agribusiness is built around large tracks of land where only one plant crop is grown, monocropping. Climate change greenhouse gases are released from the combustion engine equipment required to manage the tasks needed to sow the seeds, apply chemical, and harvest the crops. The transportation industry is needed to deliver the food products to the consumer. It is ironic that the agribusiness industry is dependent upon the very technology that is destroying the success of the business due to contributing to Climate Change. The main indicator of economic growth increased productivity (4). Increased productivity requires increased irrigation needs. Innovation is needed to combat the challenges facing the food production and supply process. It is essential that the public be well informed of the environmental and agricultural challenges facing the world. Once informed then we all may collaborate and play a part in creating solutions for a sustainable world. Climate change is a phenomenon that has developed over a two hundred year period of cause-and-effect feedback loops. So the solutions must be diverse and involve many different components of our lifestyles and living environment. Water management, re-designing our living environment, and making changes in our lifestyles are a few strategies that will provide food security for the people. Assuming environmental steward lifestyles is empowering as we realize we can make a difference in the world and provide solutions to 21st century challenges.